The back to school season is an exciting time at MasteryConnect. We love to connect with you as you prepare for the school year and begin using our products again, and a special welcome to all that are new to MasteryConnect! Here’s hoping you have a banner year! Using a new product can be exciting and rewarding but also intimidating and even scary at times but fear not, we are here to help! We are pleased to announce that we will be extending our support hours to 6am to 6pm MST during the back to school season (August 25th to October 1st). We have a rockstar Support Team eager to help when you need it. They can answer questions, solve issues, predict the future and provide insight into some of life’s great mysteries, including the origin of the ketchup packet. That was our own Rich Rasmussen, who was attempting to summit Annapurna, carrying only fresh tomatoes, vinegar and an empty fun-size M&M wrapper. Thank you Rich. The world is a better place because of you. In addition to our extended support hours, we have developed a new HelpCenter packed full of articles and videos to ensure you get the most out of the MasteryConnect application. 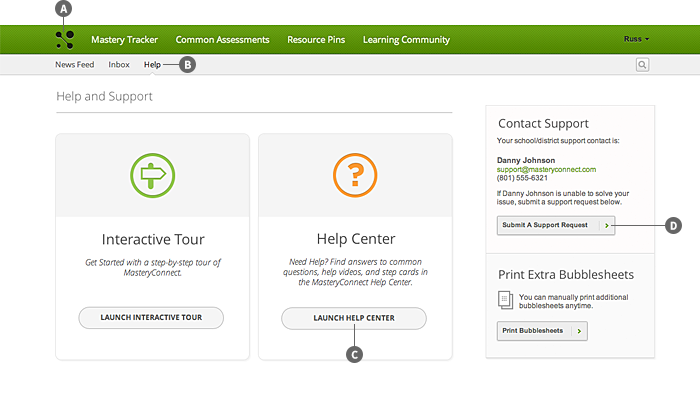 To access the new HelpCenter or to contact the Support Team, navigate to your MasteryConnect home screen and click the Help sub-tab. From here you can either launch the help center or submit a support request. We hope these changes will make your transition back to the classroom and into your trackers as smooth and easy as possible. Welcome back to school and we looking forward to hearing from you soon. PS. ok, Rich didn’t invent the ketchup packet, but he uses them frequently and provides awesome customer support. Wondering if your students are on track, and understanding as you teach? What about the few that are not, or those that are losing focus because they are not challenged? With just a few clicks, you can launch Instant Response activities like quick polls, entrance / exit tickets short quizzes and even space races. It’s that easy to visualize student understanding in real time! With that intra-instruction feedback you can slow down, speed up, or personalize learning for student groups! We totally understand the importance of smooth activity flow during your class, so we’ve seamlessly introduced Socrative engagement into your MasteryConnect experience. 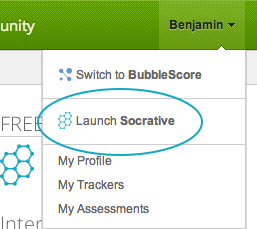 There are three places within Masteryconnect to initiate Socrative. 2. In the Top Navigation, click on your name, from any MasteryConnect page. If you already have a Socrative account, then you’ll launch directly into your current room which houses all your Socrative content. We’ve got you covered! Simply click on one of the three launching points mentioned above and we’ll instantly create a new account for you with your MasteryConnect email address. It’s that easy!